As such the industry is going through an identity crisis and metamorphosis with regards to physical stores. What’s the point of going to the shops? It’s a question that traditional retail CEOs are working very hard to address. Getting the answer to this right and transforming the physical space accordingly is key to survival in the bricks and mortar retail world. We can’t sugarcoat the headlines. It’s been a tough 2018 for retail in the UK. 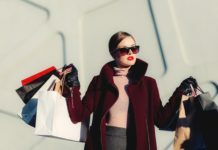 And the Christmas period, arguably the most crucial season for consumer spending, was even described as “brutal” for many high street retailers. But with the close of a year, another year begins with a fresh opportunity to ensure you can be ahead of the curve. So here are five key reminders that will put you in the best stead for tackling 2019. In eMarketer’s Future of Retail 2019 Report, Andrew Lipsman highlighted the Direct2Consumer revolution, cashierless checkout, and social commerce as the top three trends we can expect. 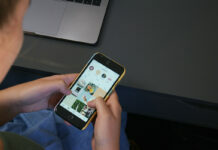 In particular, he labelled 2019 as the “Year of Social Commerce” where we should anticipate a “retail prime time” for social media playing an even bigger part in our shopping habits. 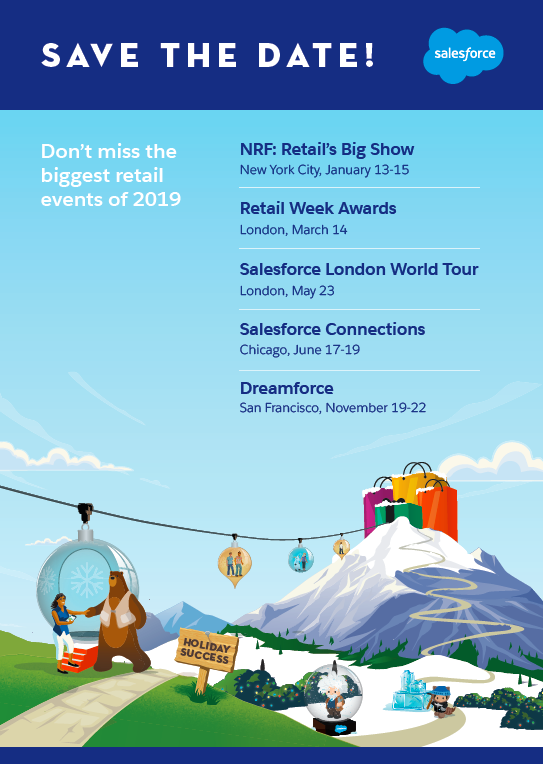 Salesforce’s retail industry experts have also laid down their predictions for this year. These predictions and trends point to how we see retailers and brands transforming into leaner, more efficient, service-led organisations – with the customer at the center of everything they do. One interesting bet was that Western consumers will begin to demand the convenience of China’s e-commerce ecosystem. Think about our current stand-alone technologies for search, payment, food delivery, transport… and compare this with WeChat’s impressive single point of access for seamlessly experiencing all these activities. You can read all the predictions here. Your shoppers are making the new rules of innovation. And as a retailer, this means you need to be finely tuned to their emerging expectations. Especially if it’s clear that half of consumers will switch from brands that they feel neglect anticipating their needs. This year it’s important to assess how well you really know your shoppers. For example – can you distinguish the shopping preferences between Millennials and the younger Gen Z . The Salesforce Shopper-first retailing Report helps answer this question and many others. It contains key insights for personalised data-driven retailing, and case studies on leading retailers. Above understanding top trends and a shopper-first mindset, the new frontier is friction-less shopping. In 2017 UK shoppers were three times more likely to get a bad customer experience than the year before, according to Facebook’s group director Martin Harbech. He explains: “that’s not because retail has got worse. It’s because expectations are rising incredibly fast”. In order to keep pace with the top brands in the field, you need to “become friction-obsessed”, is Harbech’s tough advice. In fact, one of the biggest sources of friction tends to occur at checkout. People love spending but often hate thinking about paying. The process can be messy and take too long. The solution? A unified commerce experience. This means giving users the opportunity to leverage the payment details they have already provided for third parties, in a digital wallet. Uber is the prime example of this, where users pay without even knowing. They’ve effectively made payment invisible. Stores are still the preferred shopping channel even among the most tech-savvy generation (Gen Z); 58% of whom still prefer stores. Except the stores of the future need to step away from being places of pure transaction, to being places where retailers build a relationship with shoppers. What this means is shops can no longer sit passively on the high street. They have to turn themselves into exciting destinations and get smarter at understanding what customers want. An example one digital brand that executed this well in the physical world is notonthehighstreet. 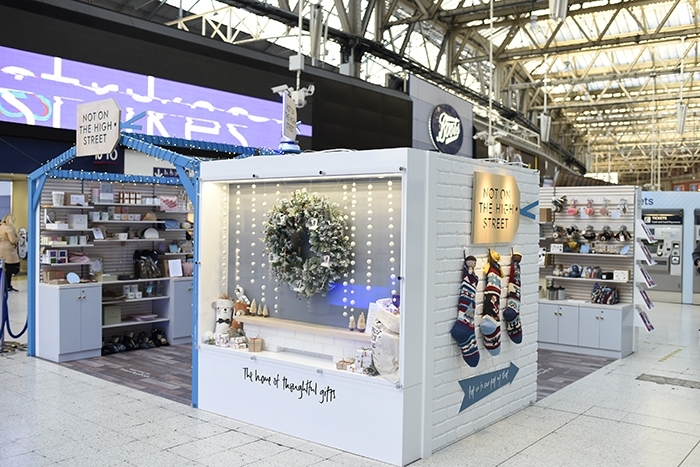 Over Christmas, the curated online marketplace opened two pop-up stores where shoppers could browse unique crafted gifts, and even take part in live personalisation workshops so that they could co-create something special while they shop. The intention according to Ella d’Amato, the brand’s Chief Commercial and Marketing Officer: “Our pop-ups will be an opportunity for our customers to really get to know notonthehighstreet…and understand the work of the 5,000 creative small businesses that sell through (the marketplace) by bringing their stories to life and demonstrating their passion for creativity in a way which it can be hard to appreciate when you’re browsing online”. While new digital tools can help retailers learn more about their customers’ needs; never forget the lasting impact of a standout experience in the physical world. “In the current climate, speed is all that matters,” says Kerry Liu, CEO of Rubikloud. “New projects used to be carried out in one or two years.. now they should be carried out in one or two quarters”. This is why Salesforce empowers retailers to speed up innovation in today’s rapidly changing landscape. We help brands deliver the unified experiences that create long-term, high-value customers relationships and, ultimately, grow their business faster.